improves cardiovascular health and brain health, reduces the risk of many diseases and can lead to a longer life. 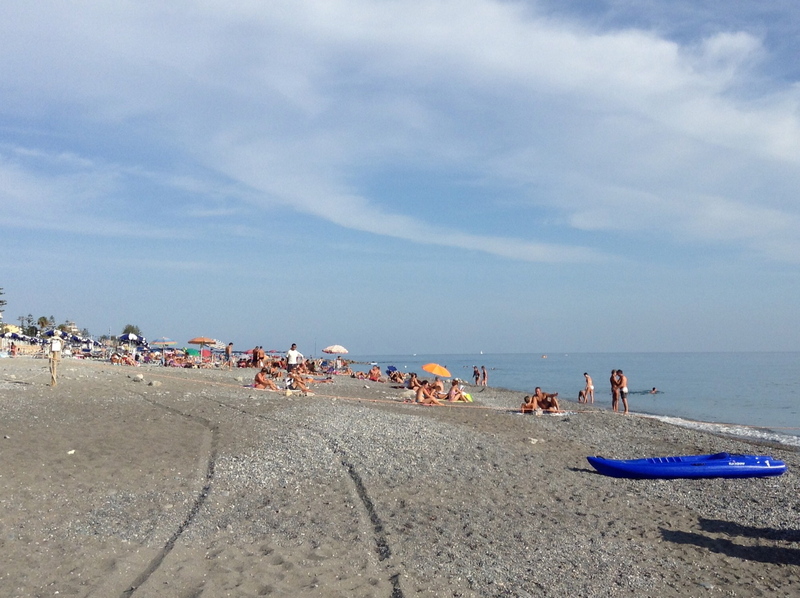 My beau and I recently spent 9 days in Italy, on the coast of Liguria, where the tranquil Mediterranean waters wash the shoreline. It was the beginning of September, and the weather was just perfect for being out and about. I can confirm that there is an abundance of healthy people at advanced ages in this region- enjoying life to the fullest. But, the food eaten in the Mediterranean region is not the only reason these people live long and disease-free lives. 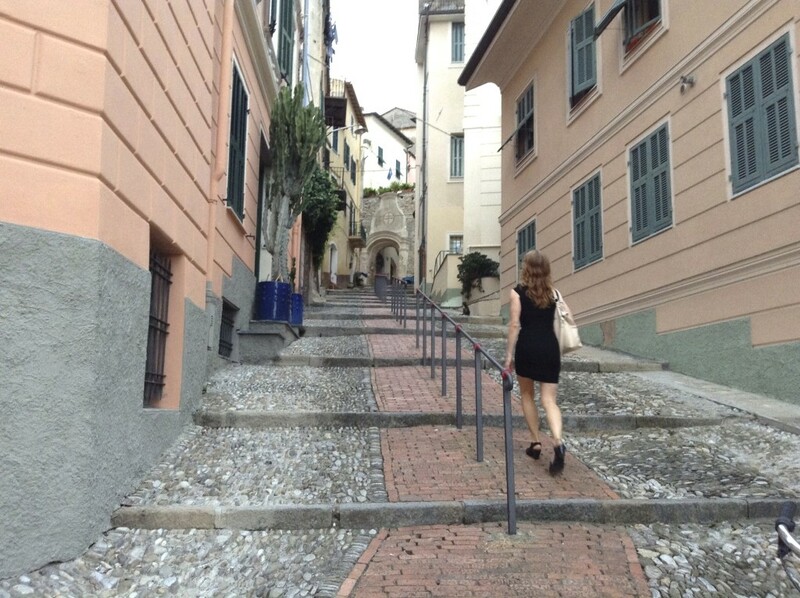 I thought I had a balanced life over here, but while visiting Northern Italy I got to see the true definition of a balanced life: 1/3 rest, 1/3 fun, 1/3 work. People in this area put more priority on friendships and relaxation than we do in the US . Movement is also a very natural part of their everyday life. These three lifestyle practices (daily movement, relaxation and relationships) are also known factors in cutting the risk of disease and providing for a much longer, healthier, and happier life. The air was least humid in the morning. As much as we wanted to sleep in during vacation, we got up as early as possible to exercise. We ran around the streets pictured above. We found many others running or biking as well. People of all ages, many well over the age of 60, were out exercising in the mornings. The local food market opened at 7am, which is the best time to get the freshest produce. In the mornings we’d see people heading home from the market in droves with fresh meat, fish, bread and dairy. to the market in the morning, with grocery bags in one hand, steering with the other. One rainy morning we saw an older gentleman riding his bike, wearing flip flops and shorts, steering while holding an umbrella and grocery bags. He made it look so easy. Physical movement is a natural part of life. All kinds of people, from 8 to 80, commute by bicycle. I found it most fun to watch the women wearing skirts and sun dresses, flip flops and espadrilles, with flowers in their hair, making their way through town. Stores and businesses close at noon and open again at 3pm – with the exception of a few cafes. This is when the sun is the hottest, the heat makes you tired, and you want to nap. Even sun-bathers go home. Since everyone else is relaxing I figured, why not nap? I would lie on my bed with the cool wind blowing through the window, sheltered from the blazing sun I was lulled to sleep. After a good 20 minutes to an hour of napping, I was up, had an espresso, and was ready for the second half of the day. 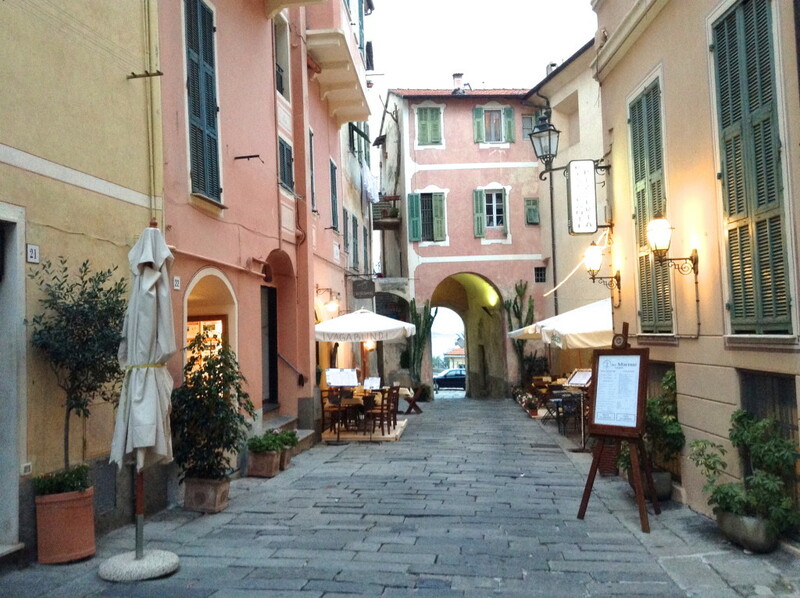 In the later afternoon when the sun is softer, storefronts re-open and the town re-awakens. 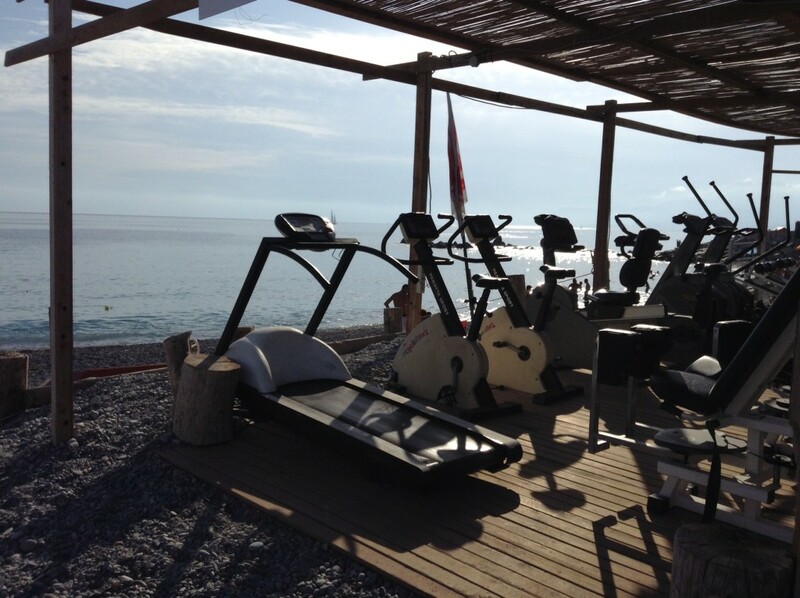 On the days we’d return to the beach, swim laps or rent paddleboards, we weren’t the only ones working out in the water. An unusual number people of all ages swam laps in the afternoon. 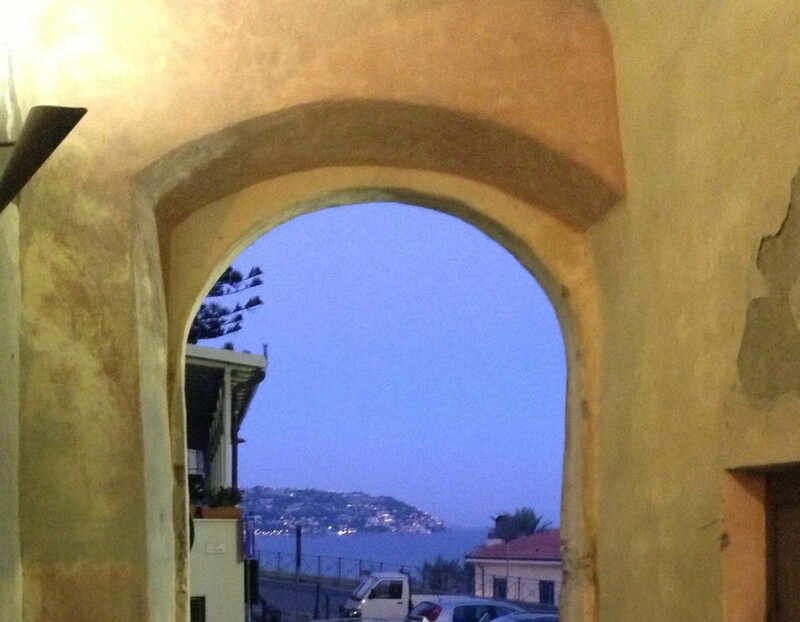 Some days we’d venture to a nearby location like Monaco, Nice, or Eze, for dinner or an afternoon tour. 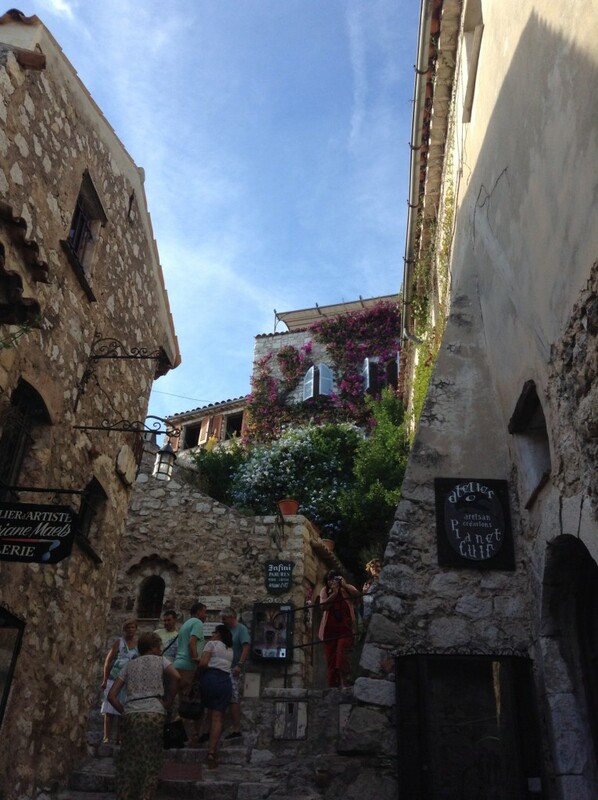 (See more pictures of lovely Eze, here). Along with bicycling and swimming, people walk up hills. The town is filled with hills, and houses built on hills. You’ve got to keep in somewhat good physical condition to live here. 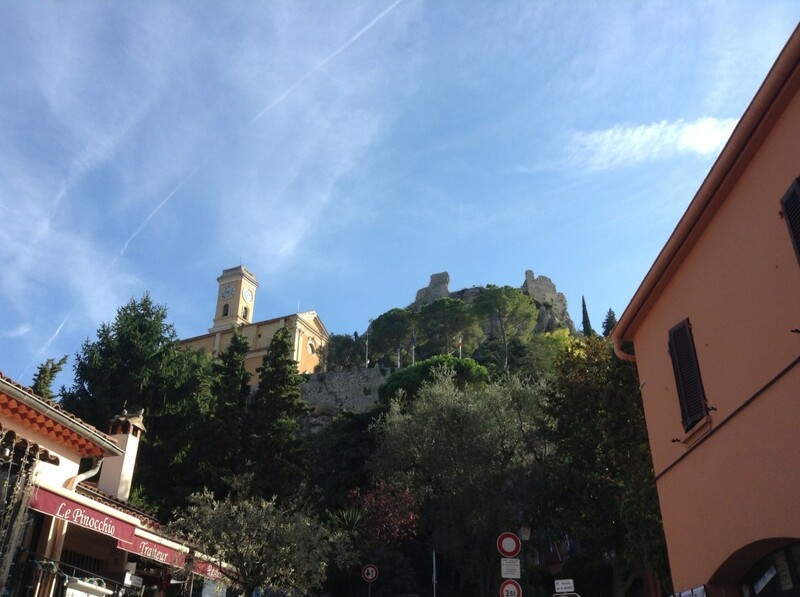 The “old city” (built circa 1600) was about a mile from where we stayed, at the top of the hill with a beautiful sea-view. You can’t travel through it entirely by car because the streets were made for horses. 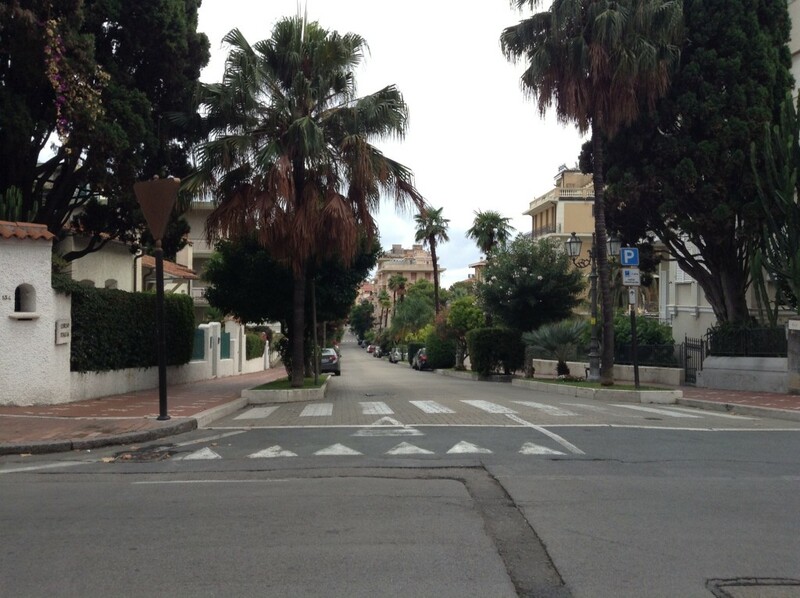 Sometimes we ran through these streets for hill workouts in the morning. 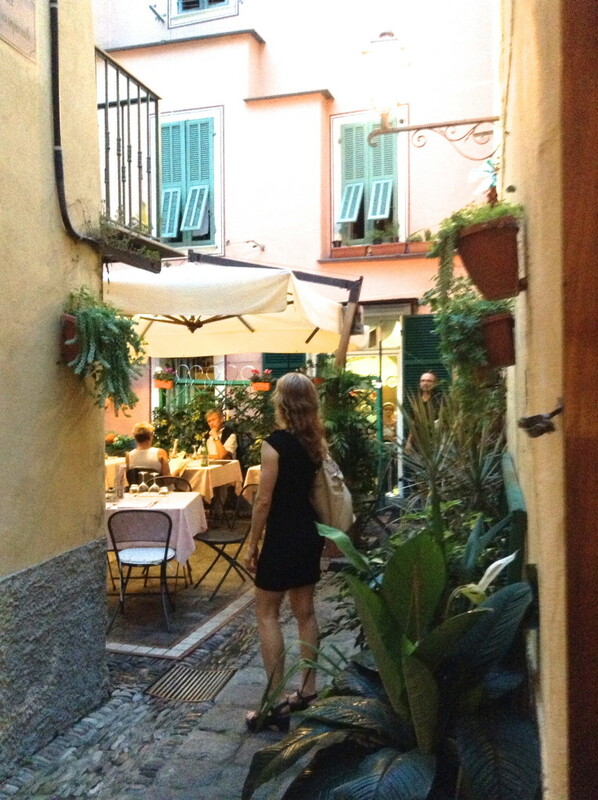 We walked there several evenings for dinner. with each other and strolling: groups of girls, families with kids, groups of women, groups of men, groups of women and men. It’s like the entire town goes out for an after-dinner walk. Some end up sitting on outdoor benches talking and relaxing for hours. The town is social, and you can tell there are many life-long friends here. At night, it’s safe enough to leave the windows open. The breeze blows through the windows and the crickets chirp happily. Sometimes you’ll hear a drunk person laughing down the street, but the town always feels sheltered and secure. There’s a softness and gentleness to life. Making a living is important, but it’s equally important to enjoy life and have relationships. People are stress-free and kind. The sidewalks are at most half the size of what you’ll find in the states, but townspeople don’t bump you as they rush by. Merchants don’t rush you to finish speaking when you’re asking a question. Waiters don’t rush you through your dinner at a restaurant. There is patience and encouragement from everyone as you try to speak their language. I came home from this vacation with a much deeper sense of what it is to live a balanced life. I’ll incorporate this precious lesson into my life as much as possible. I’ll be reminding you as well that it’s not just eating right and exercise that we need for health and balance. We need to remember to cultivate good friendships, relax often, and enjoy life whenever possible. 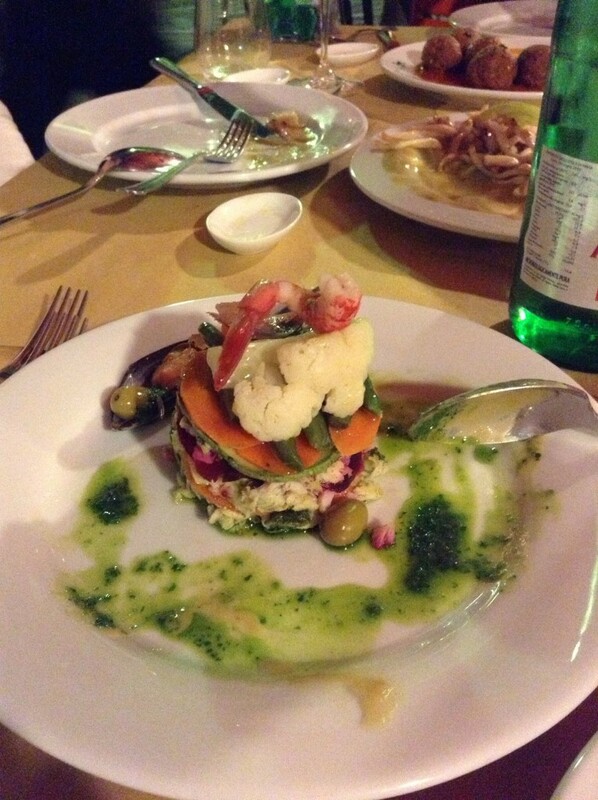 Vegetable Appetizer – with a Teeny Little Shrimp! or what do you already do, to make your life a little less stressful and more enjoyable? If you figure that out now, you could add many more healthy and enjoyable years to your future. I’m all Italian and went to Italy years ago. 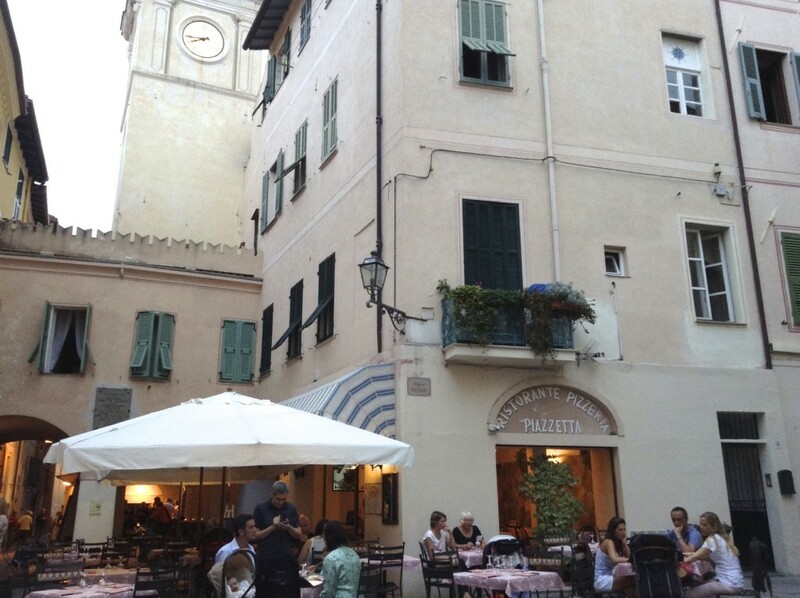 I love Italy, and I have loved the Mediterranean diet all my life because it’s what I grew up with in our family. It is by far the healthiest diet I know of today, and It really is not a diet, but rather a lifestyle choice. My great grandmother lived to be 103, and my grandmother lived to be 100. Both my parents lived to to be ninety. I’m looking forward to some good years, because like you, I work out daily and have since my youth. My mom worked out before it was ever popular here, prior to Jack La Lane. My recipes are all influenced by these factors. Loved this post! Hi, Jodee. I agree it’s a lifestyle choice and not a diet at all. How great it is that you got a head start on all of that! And your mom exercised before it was even popular – GOOD for her!! I’m glad your taking care of yourself and looking forward to a lot of active years in your future. That’s the way to live! Oh it looks so beautiful and stress free there. I need to visit a place like that to relax and enjoy. I hope you can get to a place like this soon, too, Nickida. If you feel you need it, you probably do! I’d love to hear where you go and how it went. Don’t wait too long. Sara, Thanks for stopping by! I haven’t been to Spain yet. It’s on my list! Beautiful story! Thank you for sharing Luci. I’m officially inspired. Thanks, Skye. 🙂 I’m so glad you liked it! What is the name of the town you stayed in? It looks fabulous for a vacation! Hi, Doris! 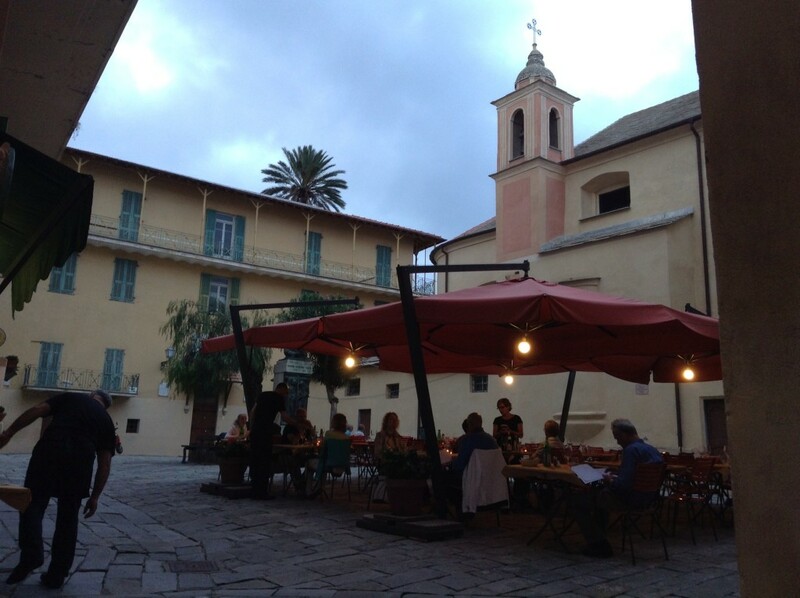 We stayed in Bordighera. 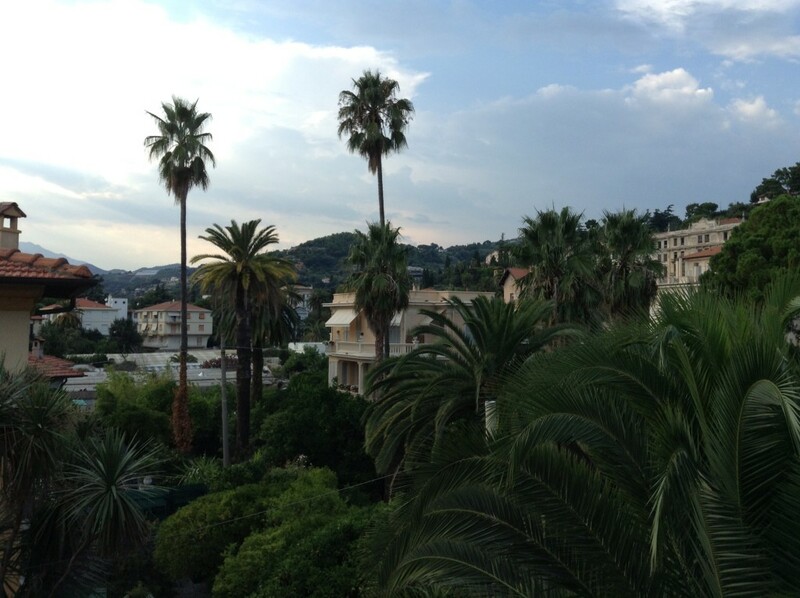 It’s within driving distance of Monaco, Eze and Nice, FR. Fun! I hope you do go, Oyunaa!